Is it time for magnetic tape to come back as a storage option? So why would anyone even think to store data on magnetic tape when we are living in the era of high speed cloud based storage systems. However, what CIOs are starting to realize is that when you put your data onto magnetic tape, hackers have no way to get their hands on it. Right now the U.S. federal government and other regulated industries are all actively using magnetic tape to store information. More and more firms are once again starting to look at using magnetic tape as hackers become cleverer and start to do more damage when they are able to break into a company. The issue that the person in the CIO position is dealing with is that if the bad guys are able to break into their systems, then they could tamper with, alter, or even delete the company’s data. Considering the value of that data to the company, this could have disastrous consequences. This is why using magnetic tape as an offline backup system is starting to make so much sense to firms. More and more magnetic tape is starting to become part of a firm’s best-practice backup strategy. CIOs understand that if the worst happens, the company’s data is compromised, they need to be able to restore it as quickly as possible. However, if the way that they would normally restore their data by using a traditional online backup copy somehow gets compromised, they need to go one step further and have a slower worst case recovery mechanism. As with so many other things in the IT department, a CIO understands that a good backup strategy will have multiple layers to it. Magnetic tape has been used in IT since the 1950s. 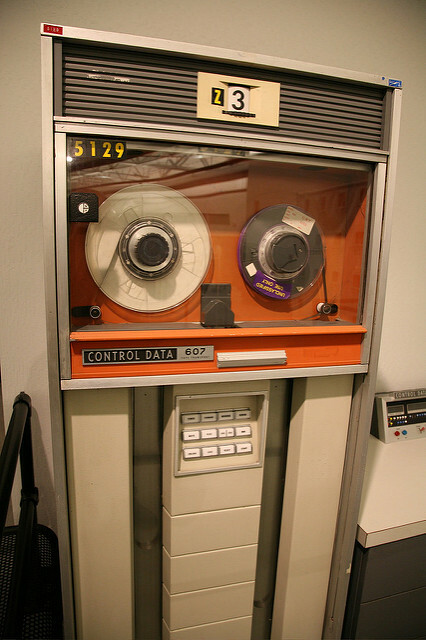 Back in the day, companies used magnetic tape as the most reliable form of large-scale data storage. Often companies would load up full reels of tape with company data and then have the reel sent to an onsite library for storage. So what ever happened to magnetic tape? Over time computers improved and became both faster and more compact. Magnetic tape followed these developments and evolved from reels to compact cartridges that were able to store a great deal more data. These cartridges also made physically transporting the data much more convenient. Time, of course, marched on and companies moved from magnetic tape to digital records and finally on into the cloud. Today’s firm’s don’t even have to purchase or manage servers in order to keep copies of their data. Why use magnetic tape once again? People who use magnetic tape believe that it offers a number of advantages over other ways of storing corporate data. The hard drives that many digital storage systems use can fail which means that magnetic tape may be more reliable. Data that has been put on magnetic tape will last for a long time. The lifespan of a magnetic tape is estimated to be 30 years. When the cost of storing data is calculated, it turns out that the cost of storing a terabyte of data on magnetic tape is the lowest of any storage medium. The best tapes can hold up to 15 terabytes of data and can be stored in third party locations at a cost that is much less than cloud-based storage. When data is stored on magnetic tapes, it can be encrypted in order to ensure the security of the data. This means that when the data is retrieved, it will also need to be decrypted. CIOs need to realize that magnetic tape is not designed to be the primary way for a company to restore any of their data that they have lost to hackers. However, it can provide them with a safe alternative option. Backing your data up into the cloud is very convenient to do. Backing company data up onto a magnetic tape system is not as convenient. However, CIOs need to realize that good security is more often than not inconvenient. CIOs are the ones who are ultimately responsible for making sure that the company’s data is kept safe from hackers. The challenge that they are facing these days is that hackers have become very good at gaining access to a company’s network and once inside tampering with company data. What can a CIO do in order to ensure the integrity of the company’s data? It turns out that the answer may be to once again start to use magnetic tape to store company data. The reason that magnetic tape is once again becoming a viable option for storing a company’s data is because data that is stored on it is out of the hands of hackers. Hackers may tamper with, alter, or even delete company data. Magnetic tape backup of company data allows a CIO to restore the company’s data after a break-in has occurred. CIOs understand that any good backup strategy will have many layers to it and magnetic tape can be one of these layers. Magnetic tape has been around since the 1950s and has evolved from reels to cartridges. Magnetic tape is viewed as being reliable, lasting a long time, and being a very cheap way to store data. Magnetic tape may not be a company’s primary backup method, but it can act as a supplement to their traditional backups and provide an extra layer of data security. Considering the value and importance of a company’s data, keeping it safe is one of a CIO’s primary jobs. Keeping that data out of the hands of hackers is one of the best ways to make sure that it has not been tampered with. Magnetic tape provides a proven way to make backup copies of the company’s data that can then be kept out of harm’s way. CIOs need to take the time to determine if this 1950’s technology should be playing a role in the company’s current backup strategy. Question For You: If you started to backup your corporate data to magnetic tape, where should those magnetic tapes be stored?